I decided to pick up Starblood Arena the other day. 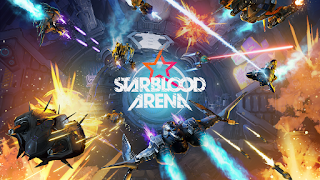 Developed by Whitemoon Studios and Published by Sony, it was released on April 11, 2017; Starblood Arena is essentially a arena shooter with mini spaceships. Starblood looks fantastic. The graphics are vibrant and stylish. It's very comfortable to playthrough and outside of one mishap I experienced next to no nausea. The tutorial was great, went over the controls and gave you a chance to find your space footing before being thrown out into chaos. You're conventional style of left, right, up, and down have no meaning in Starblood Arena. The game is played in full 360. What once was left, followed by some spinning may now become right, up, or down. At first it can be disorienting but it quickly becomes comfortable and next thing you know you've been playing for a few hours. It's very reminiscent to Descent and Forsaken gameplay wise. 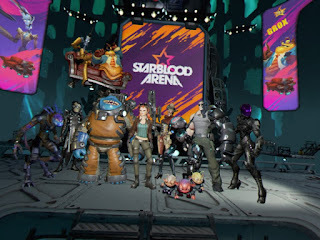 There is a good sized roster in Starblood. With nine different pilots from all over the galaxy come to blow each other up for fame and fortune. Where it's all televised through the Starblood Network! With some mediocre commentary from your favorite alien/robotic duo, J3-RY and Grox. J3-RY is the serious commentator whereas Grox is the "comic relief." Though I haven't played as every pilot yet I've found the most success with Elsa and Gundo. Each character has their own personality and aren't two-dimensional like a few games I've played recently. The combat is very tight as each pilot has their own abilities and weaknesses. Some do huge amounts of damage but can be destroyed easily. Others can get in your face with the comfort of having a front shield to protect them. You may have to rethink your strategy when you change up pilots which is nice. Each pilot also have different voice interactions depending on whats going on around them. Such as if a kill is stolen or when you go on a streak. There are a few different game modes available to you. There is Carnage which is a free-for-all mode. Team Carnage is obviously your basic Team Deathmatch. In both of these modes around the halfway mark you will see a shift in the arena. 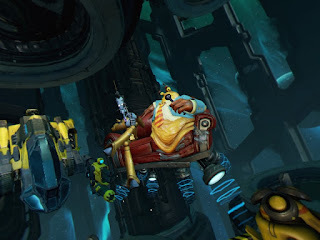 Let it be with repair bots or turrets and electro-spheres will show up around the arena. Gridiron is more of a sports mode. Simply get the ball and either dive or shoot the ball into the goal. Diving will give you three points and shooting will give you just one. So it's best to try to risk the dive. Instead of dying in this mode you become immobile. Activating after a few seconds after your repairs to either save the goal or get revenge. Or to just sit there and watch the person who immobilized you score on your goal. It's neat to have it that way other than blowing up and waiting to respawn. Then there is the cooperative Invaders game mode. Where you and three other players online protect an objective from waves of enemies. This game mode is perfect, especially for a game in VR. If you're not too crazy about playing online you could do it in single player too. Then the single player Burn Circuit, a series of A.I. games that increase in difficulty. After finishing them however, you get gold skins for your character/ship. Along with the gold skins you can acquire ship mods with each level up with each character. Each mod has a price though. You can get homing missiles but it will also decrease the damage of said missiles. Or some will just have cooldowns, like a shield that decreases damage for a certain amount of time. You can get ship skins, attachments, etc. Unfortunately I haven't had much experience with the multiplayer. This is where the community groups on PSN come in handy. Especially with VR, not everyone is going to be online as often as your regular PlayStation owner. So it's best to join these communities and arrange a day to play among the other members in the group. Which brings me to another topic. Every Wednesday is "Wednesday Night Wars" where the developers will get online and play the game with you. All you need to do is go through quick match and you'll be paired in a match with them. That's awesome. Its nice to see a developer try and establish a relationship with the consumers that purchased their product. From few games I played I had a blast. 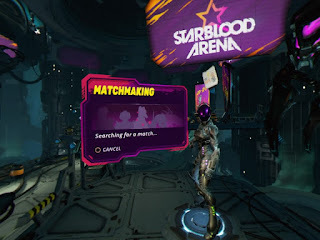 With a very few amount of shortcomings, Starblood Arena is a fantastic addition to the PlayStation VR. I's loaded with style and is overall a bunch of fun. I'd recommend anyone that has the unit to purchase this game or at least try it out. It's worth it 100%.